For other uses, see Sett (disambiguation). A Sett, also known as a block, Belgian block or Sampietrini, is a broadly rectangular quarried stone used in paving roads and walkways. Formerly in widespread use, particularly on steeper streets because setts provided horses' hooves with better grip than a smooth surface, they are now encountered rather as decorative stone paving in landscape architecture. Setts are often referred to as "cobbles", although a sett is distinct from a cobblestone in that it is quarried or worked to a regular shape, whereas the latter is generally a small, naturally-rounded rock. Setts are usually made of granite. Places paved with setts include many streets in Rome and elsewhere in Italy (where blocks are called sampietrini or bolognini), since the technique was first used by Romans, in Aberdeen (Scotland), much of Edinburgh's Old Town and New Town, and Red Square in Moscow. 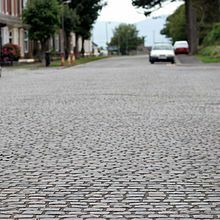 Silloth on Solway, the seaside town in Cumbria, still has the setts (originally laid in the 19th century) on Eden St and the seafront Criffel Street. Streets paved with setts feature in cycling competitions including the "Tour of Britain" which visited Silloth on Solway in 2015. In Bruges, Belgium, most roads are in Belgian blocks in the center, but in recent years many of them have been replaced by asphalt to reduce noise. In New York City, the West Village (including the Meatpacking District), SoHo, and TriBeCa neighborhoods retain such streets. The Holland Tunnel used the blocks extensively and can still be seen in some spots including under pavement of service roads on the New Jersey side. Older sections of Brooklyn such as DUMBO and surrounding neighborhoods also have streets bearing Belgian blocks. Germantown Avenue in Philadelphia, in particular its upper reaches through Germantown, Mount Airy and Chestnut Hill, is notable for being paved with Belgian blocks; repaving projects on this thoroughfare have retained or reintroduced block paving to give additional historic character to these neighborhoods. Part of this character includes the tracks of the 23 trolley, though the modern tracks are encased in concrete slabs rather than blocks, and the trolley line itself is currently operated by buses. In Richmond, Virginia, Belgian block streets are particularly common, most notably in Shockoe Slip. Street cars traveled through the street on tracks that are still visible though the system has been replaced by buses. The Fells Point neighborhood of Baltimore also has Belgian block streets. In many cities besides Richmond and Philadelphia setts have often been used for pavement around street-running trolley or tram lines in the same manner as brickwork. Portland, Oregon, used Belgian block paving extensively in the 19th century, starting near the Willamette River, to stop the streets from washing away in floods. Many streets in older parts of the city are underlain by these blocks, and a few streets in the Pearl District still feature this kind of pavement. The City of Portland stockpiles these blocks when they are dug up for street or utility repairs or renovation. They have been used between the rails in some of TriMet's MAX light rail lines to warn automobile drivers that they are driving on light rail right of way. The romantic claim that old Portland "cobbles" were imported as ship's ballast is incorrect; they are local basalt, quarried near St. Helens in Oregon. In older towns and cities setts may be used to outline buried archaeological features beneath the road surface such as city walls, gates and cathedrals, for example the first Rochester Cathedral. Streets paved with setts (French: pavé) are highlights in several cycling competitions such as the final Champs-Élysées stage of the Tour de France and the Paris–Roubaix road race. Riding upon sett is more technically challenging than riding on asphalt concrete. Much of the Royal Mile in Edinburgh, Scotland, United Kingdom is laid with granite setts, as here looking east towards the Tron Kirk. ^ Oliver, David. "A Walking Tour of The Royal Burgh of Wick". Caithness.org. Retrieved 2009-03-04. At the first building after the end of the bridge, turn left into East High street which has not been widened and still has old stone setts. ^ Potter, Chris (October 14, 2004). "Were Pittsburgh's original finished roads and streets paved with cobblestone, Belgian block or some other type of brick?". Pittsburgh City Paper. Retrieved 2009-09-23.